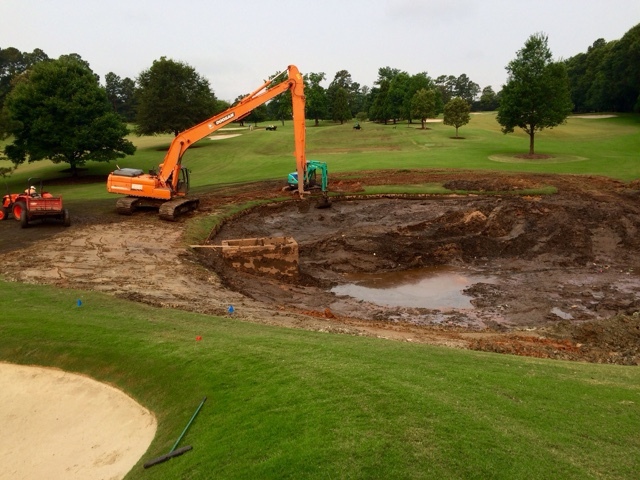 We are now in day five of our summer course closure for maintenance, and wanted to give you an update on all of our progress. Our team has done a fantastic job, and we are ecstatic to report that are currently ahead of schedule! These ten days are extremely important in the scope of our maintenance year as an agronomy team, and for East Lake as a whole. 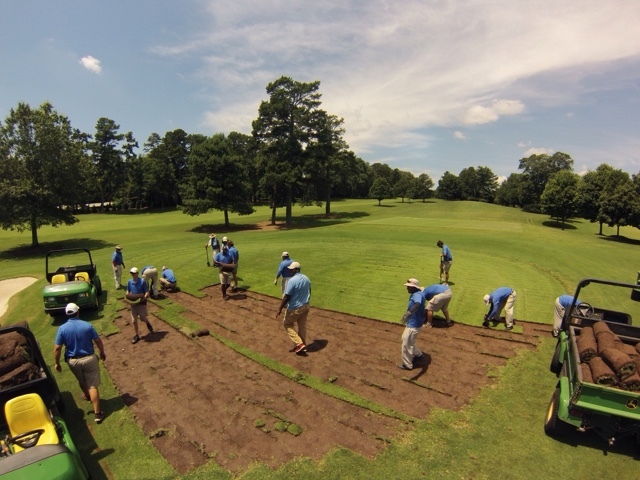 These ten days allow us to perform maintenance practices which are necessary for providing championship caliber playing conditions, but result in temporary conditions which are not acceptable for daily play. 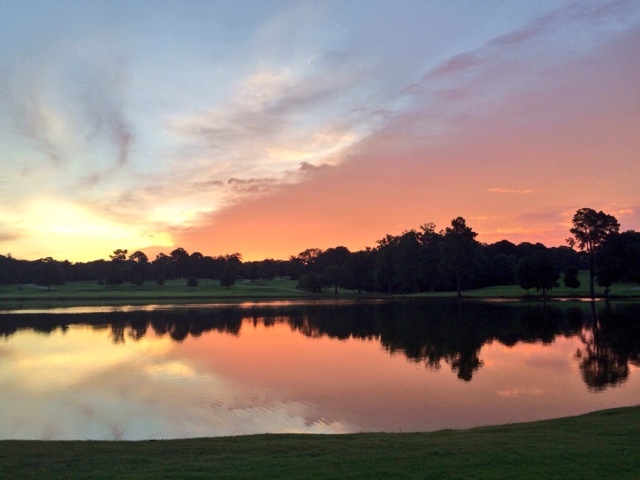 All of that to say, our team takes full advantage of this time as we have been working from before sunrise to after sunset. 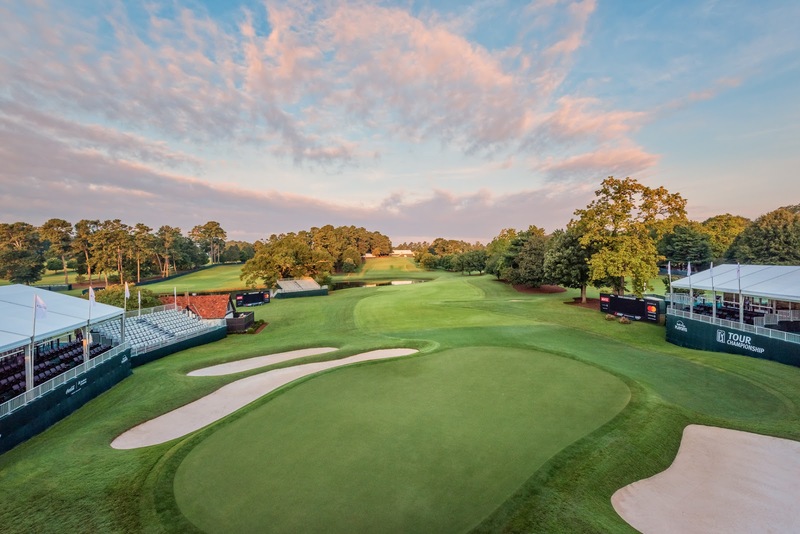 We have focused our maintenance goals to perform the practices which require the most recovery time first, allowing us to provide the best possible conditions for our re-opening next Thursday. 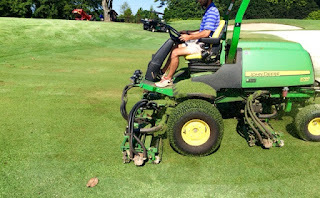 -Heavily topdress greens with USGA greens mix sand.-Aerate greens with Procore 648's using 5/8" outside diameter hollow tines (1.5"x1.5" spacing).-Shovel cores from the core-harvester box mounted on the back of the Procore, into a Pro Gator and -dump off-site. 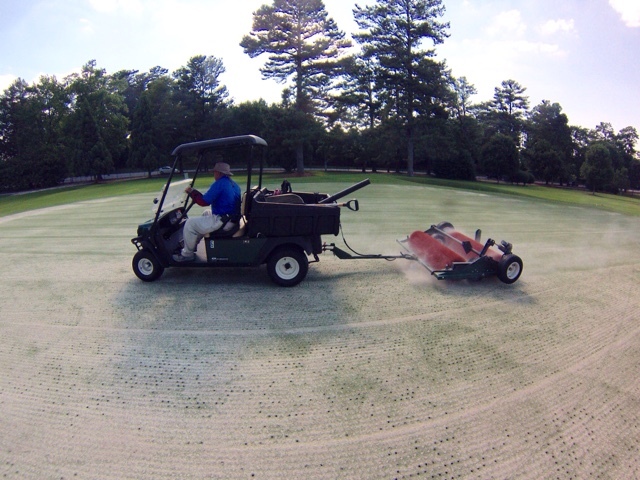 -Roll greens with a Tru-Turf Tournament roller-Brush greens with a Sweep-N-Fill brush-Water-Repeat entire process one time-In all we incorporated 110 tons of fresh UGSA greens mix sand into our greens! -Aerate fairways with a John Deere Aerocore 2000, using 5/8" outside diameter hollow tines (2.5"x2.5" spacing). This is at 1.6mph by the way........ patience is key! 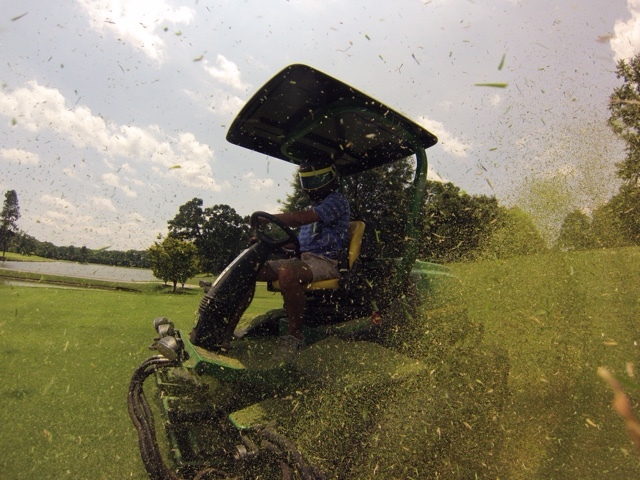 -"Mow" with a John Deere 8700 fairway mower, set +.050 above normal height in order to ride above -the leaf blades. 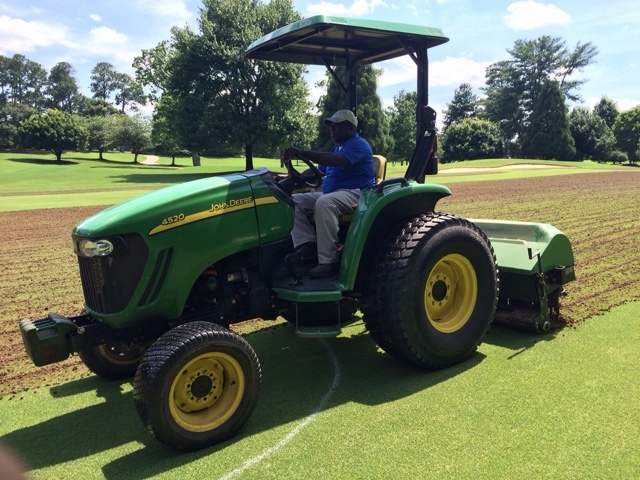 -Aerate tees with Procore 648's using 5/8" outside diameter hollow tines (2"x1.5" spacing). 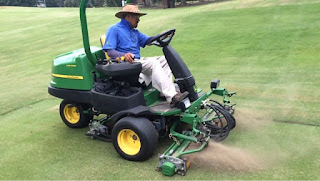 -Pulverize cores with John Deere core pulverizer. -Drag cores in order to reincorporate the soil into the canopy. 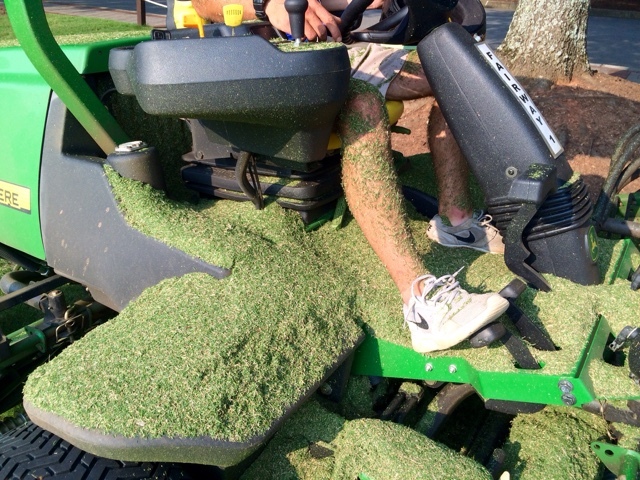 -Same as tees accept: Final mow at .350" and green surround's rough was aerated at the same time. 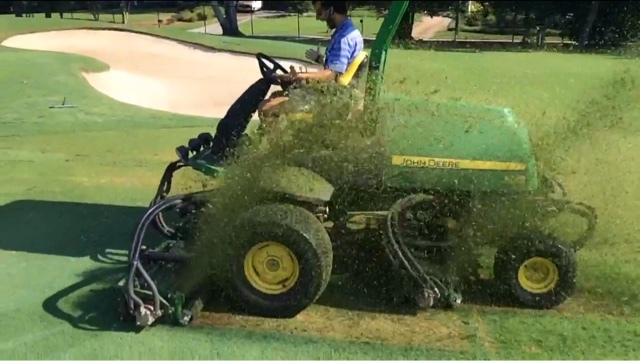 -Turf Dynamics performed our Green's Dryject again this year. They run a great operation and have always done a great job for us. 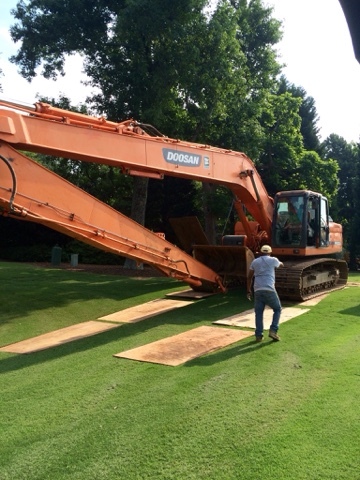 -3"x3" hole spacing, 7" penetration depth. 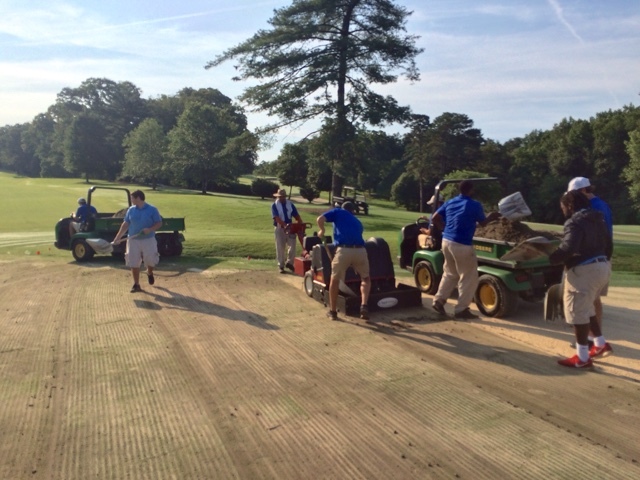 -In all we injected 24 tons of sand into our greens over a 6 hour period! 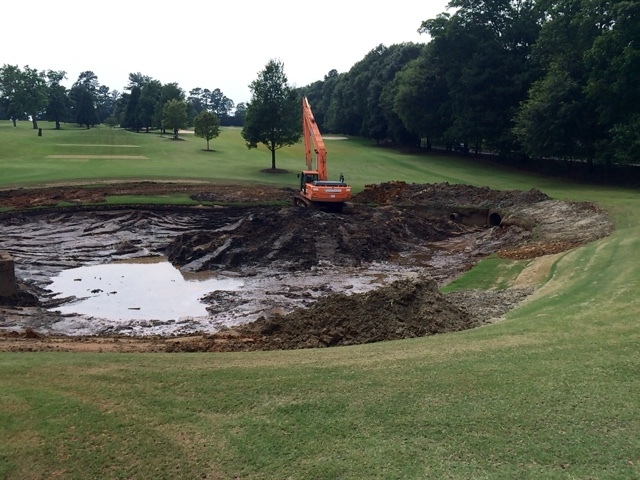 Right out of the gate we saved the Meyer Zoysia off of the previous Short Range target green. 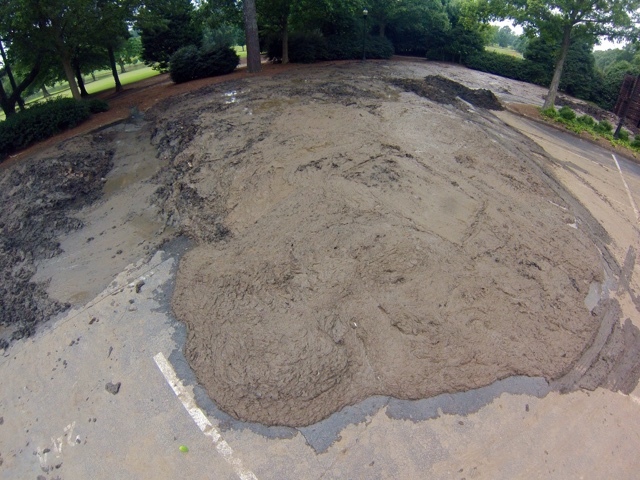 This will be used to completely restock our fairway nursery. 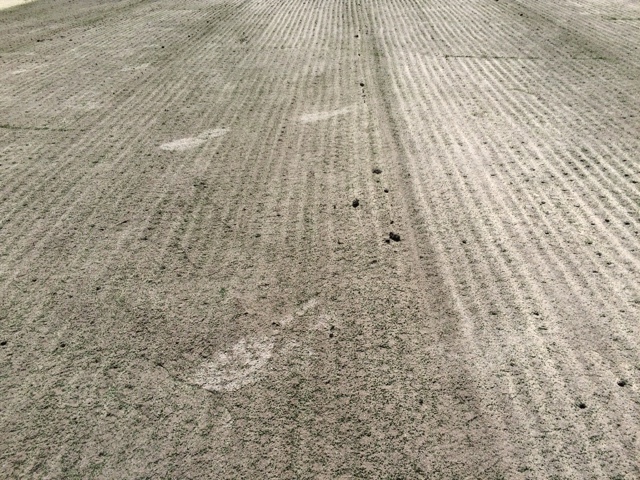 Condition of Greens after a single aeration and removal of cores. 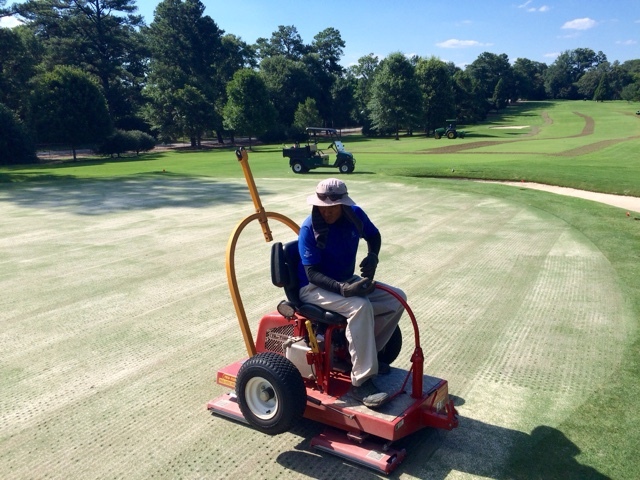 Sweep-n-fill on the greens after the roller. 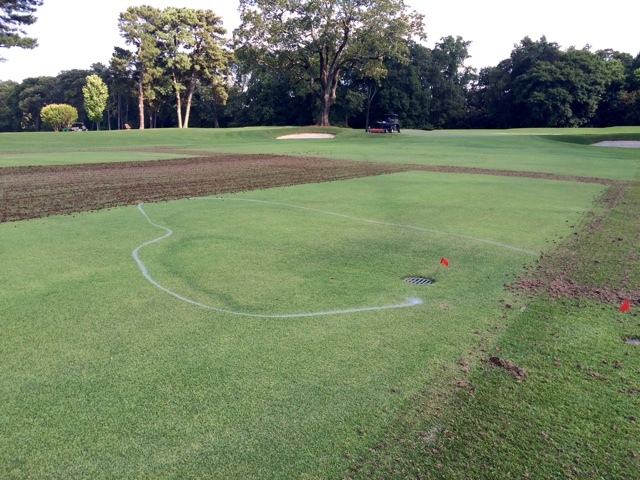 Fairway Fairy Ring being marked for post aeration treatment. Approaches being scalped into the grain. We opened the rear-release flaps on the reels to improve our quality of cut. This created some sweet rooster tails! The scalping process was very effective...and messy! Proper Person Protective Equipment had to be called in. Safety first! 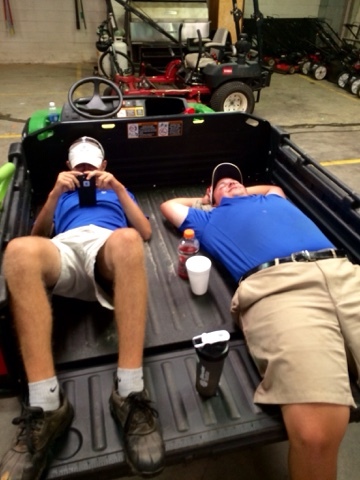 Our 2015 interns Clint Connard and Will Bowling enjoying a brief moment of solitude during a lightning delay. 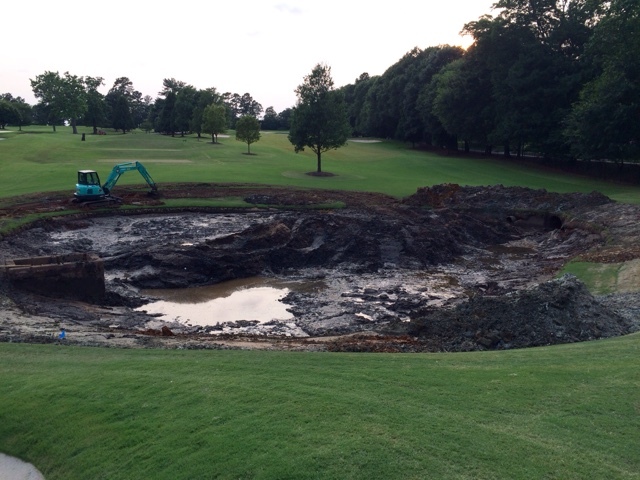 #2 containment pond Has done it's job and contained about 12 feet of silt from our main bodies of water! Day 3... Almost to completion. Sides will be shaped to a more desirable slope and grassed. 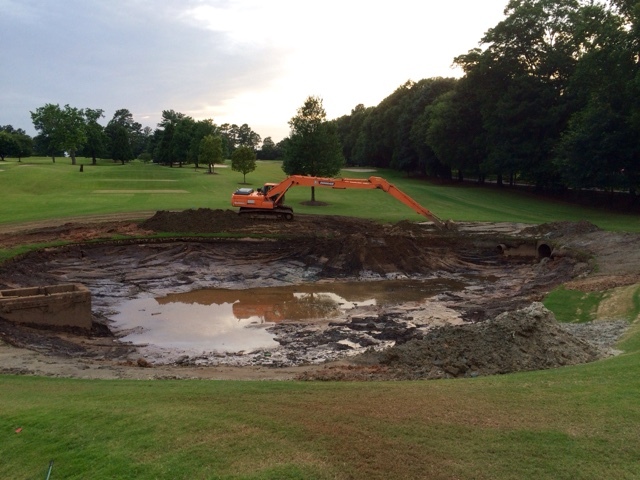 This was only one-third of the sediment removed. 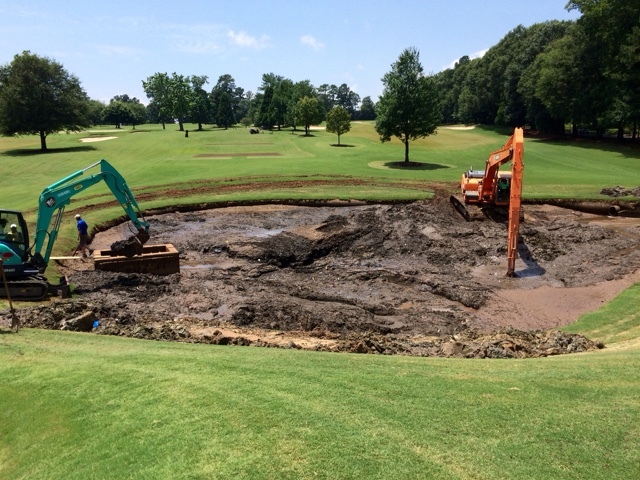 Staged here to dry before removal. 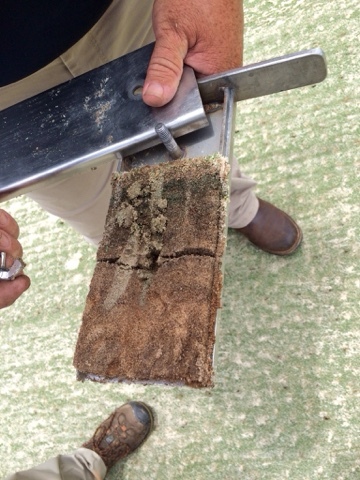 Dryject soil profile being examined. 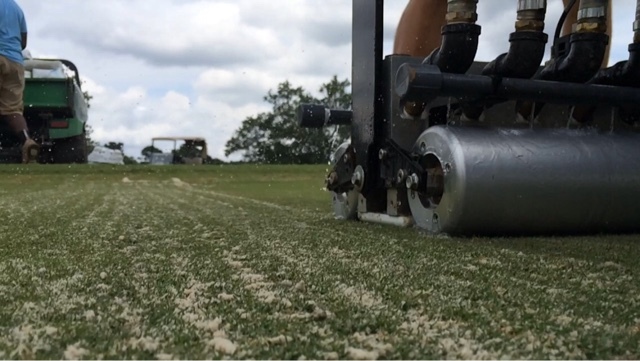 Up close and personal with the Dryject. Thank you for visiting, come back next week for part 2!